The 16th meeting of the Council for Promoting Tourism in Asia (CPTA 16) officially kicked off in Hanoi capital city on September 6. The event, which runs until September 9, sees the participation of representatives from CPTA member cities, including Tokyo (Japan), Kuala Lumpur (Malaysia), Jakarta (Indonesia), Taipei (Taiwan), Manila (the Philippines), and Hanoi. This is the fourth time that Hanoi has hosted the meeting. The CPTA member cities will review cooperative activities implemented during the past few years and design plans to carry out new projects. Participants will look for measures to lure more visitors to Asian cities through cooperative projects, programmes, and campaigns. They will also seek solutions to improve tourism management of State agencies and promote cooperation between those agencies and organisations and businesses of CPTA member cities. On the sidelines of the event, the host city is set to hold an exposition and tours for participating delegates around Hanoi’s tourism destinations such as the Mausoleum of President Ho Chi Minh, the Temple of Literature, the Thang Long imperial citadel and the Bat Trang ceramics village. 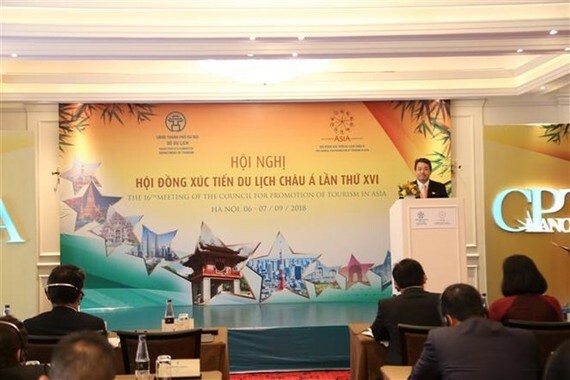 Speaking at the opening ceremony, Vice Chairman of the Hanoi People’s Committee Ngo Van Quy said the capital will actively participate in activities of the CPTA. Being the host of the meeting, Hanoi has a chance to promote itself as a dynamic and friendly destination to international friends and devise suitable and attractive tourism programmes for foreign visitors. CPTA President Yuji Fujita said the meeting will discuss the continued organisation of a photo contest, adding that after two editions, it has attracted many talented photographers to capture the beauty of each city.